We eat (and drink!) with our eyes, so it’s no wonder a hot pink smoothie adorned with a “mermaid” garnish would appeal to my 6-year-old daughter. This delicious and nutritious smoothie is the creation of Jessica Rosen, a certified holistic health coach and co-founder of Raw Generation. Thanks to the dragon fruit (a brightly colored fruit from Asia), mango and banana, it’s packed with antioxidants that help boost the immune system and beautify the skin. The coconut oil that is also added helps to improve energy, cognitive function, plus a bevy of other nutritional benefits, while the maple syrup offers a bit of extra sweetness and a healthy dose of essential minerals. It’s magical to your eyes and your body! What mom would say no to that? Optional: garnish with a teaspoon of detoxing spirulina for added health benefits and a deep blue-green pop of color. Tip: Look for dragon fruit in Asian markets. Select as you would an avocado - if it gives slightly when pressed then it’s ripe, too soft and it will be overly ripe (allow hard ones to ripen for a few days at room temperature). Cut the dragon fruit in half from top (green stem) to bottom. Cut a sliver of the fruit off of one half to use as your mermaid garnish (note: the skin is inedible and should be used as a garnish only). Scoop out the flesh with a spoon and add it to a blender. Add the remaining ingredients to the blender and blend until smooth. 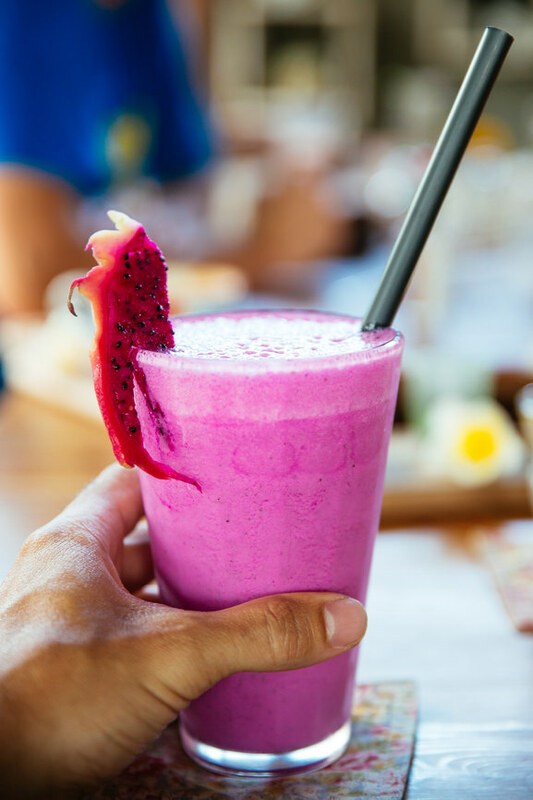 Pour into a tall glass and garnish the rim with the dragon fruit “mermaid.” For a ombré effect, add a bit of green algae, such as spirlina, along with a teaspoon of water to the bottom of the glass. Stir, then slowly pour in the smoothie.